Exodus is one of the most popular and resilient video streaming add-ons for Kodi. 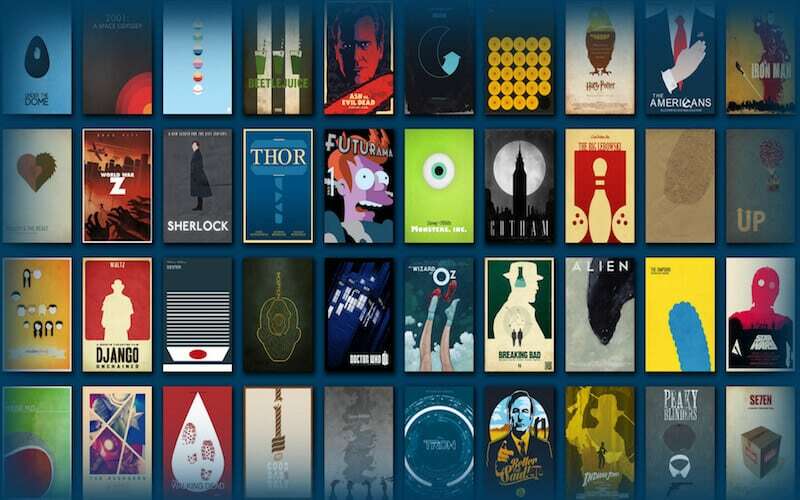 Although Exodus is used by a large number of Kodi users, it’s completely unofficial. You won’t find this add-on in the Official Kodi Add-on Repository. This means that most, but not all, of the TV shows and movies streaming through Exodus are also unofficial. When asking whether an add-on like Exodus is legal, we must first clarify which party is asking. In most cases, we’ll assume that the person asking wants to know if they can get into legal trouble for watching videos on Exodus. Can I legally stream video on Exodus? Exodus offers some legal content, but not much. You might find TV shows and movies that just happen to be free or part of the public domain, but there’s currently no way to filter out illegal sources beyond turning off specific providers in the settings. However, you’ll need to know exactly which of the 100+ scrapped sites is offering illegal content, and even then, some of the content they provide might be a mixture of public domain and pirated TV and films. All told, the vast majority of the content in Exodus is pirated. In most parts of Europe, including the UK, streaming pirated video is illegal. A court ruling earlier this year stated that the temporary files created on one’s device by streaming video players are not exempt from copyright laws. In the US, the rules are less clear. The US has no such court precedent for streaming video, although downloading entire files is definitely illegal. Whether streaming video from the web falls under the same rules as an activity like torrenting video files is unclear. Some countries (most notably India), explicitly allow people to stream pirated content. Exodus users in India should have nothing to worry about when watching TV shows and movies on Kodi; however, this does not take it ethically right. In many countries, there are simply no laws or court precedents on the book when it comes to piracy and/or streaming from pirated sources. We advise you to check your local laws and regulations before using Exodus. That said, we are not legal experts. The opinions expressed here regarding Exodus legality are purely based on research by this article’s author. If you need more certified information on whether Exodus is legal in your country, please do your due diligence in researching how the laws work in your region. While we do not recommend Exodus for Kodi users, both unofficial add-ons like Exodus and official add-ons have unique privacy and security risks that make a VPN almost always necessary. Although use of a VPN is popular for Kodi users trying to evade detection while streaming pirated content, there are reasons beyond this that make a VPN necessary. Exodus and add-ons like it come with some privacy risks. Any third-party add-on can be hijacked and used to spy on your web activity using man-in-the-middle attacks. Additionally, Exodus itself at one point was used to create a DDoS botnet out of unsuspecting users. Exodus and the sources from which you stream videos will have access to your IP address, at the very least. An IP address, while it does not constitute an identity, can be used to trace activity back to your device and pinpoint your location. In the hands of a copyright troll, for instance, this information could be used to extort money from you. It could also be used to target your device with advertisements, spam, and malware. For these reasons, we strongly suggest you always employ a reputable VPN when using Kodi. A VPN, or Virtual Private Network, encrypts your device’s internet traffic and routes it through a server in a location of your choosing. Good VPNs like IPVanish prevent add-ons and sources from seeing your real IP address, which is instead masked by the VPN server’s IP address. 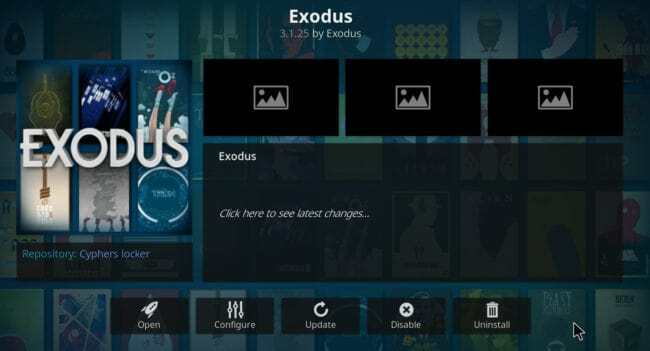 Even if using Exodus is not strictly against the law where you live, your ISP might frown upon such activity, throttling or suspending service to reprimand Kodi users. A VPN will keep your activity private from your ISP. It has the added effect of preventing your ISP and other parties from monitoring your online activity, as the contents of your streams are hidden inside the encrypted tunnel. Our recommendation is IPVanish, a fast and reliable VPN provider with a good reputation and strict no-logging policy. IPVanish also has a Kodi-friendly interface that works well with devices that use remote controls instead of keyboards and mice, such as the Amazon Fire TV Stick. IPVanish works with all Kodi add-ons that we’ve tested. If you want to look at a wider range of options head over to our list of the best VPNs for Kodi. For Exodus and third-party add-ons like it, a VPN will help secure your privacy by making your data obscured, helping prevent hacker spying in most cases, in particular, MITM attacks. Antivirus software is also likely a good idea to help prevent downloading add-ons that have been hijacked with malware. Reader deal: Save up to 60% on IPVanish here. In this section, we will be exploring add-ons from the Official Kodi Add-on Repository. Some of these have collections of content which rival or even exceed that of Exodus. Better still, they’re completely legal and have been created and approved by an official organization. 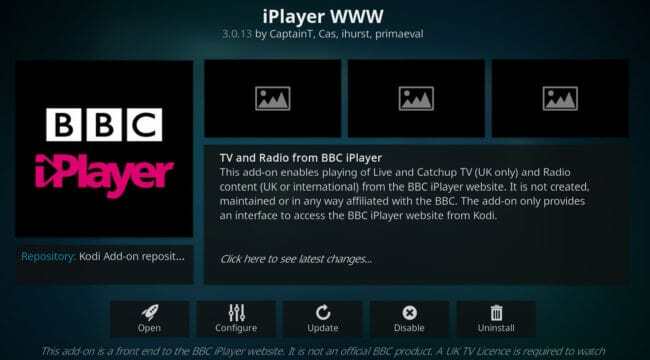 If you live in the United Kingdom there’s a good chance you’re already familiar with the BBC iPlayer. To watch any of its content legally, you will require a TV License. However, there’s a very large selection of TV shows, films, radio content and even live programming available. A fair portion of the content is only accessible from within the UK, so remember to set your VPN to a British city before loading the add-on. iPlayer WWW can be found within the Official Kodi Add-on Repository. A significant number of people are shunning traditional television in favor of online entertainment. If this sounds like you, you might be interested in installing the YouTube add-on. Whatever you’re interested in, from long form gaming content to sports or even to make up tutorials, YouTube will have something to offer. You will have to pair your device before you can really use the add-on, but this only takes a second. YouTube is free, legal, and it would take several thousand years to watch all of the content it hosts. When you take these facts into account, it quickly becomes clear that Youtube is one of the best official add-ons available. 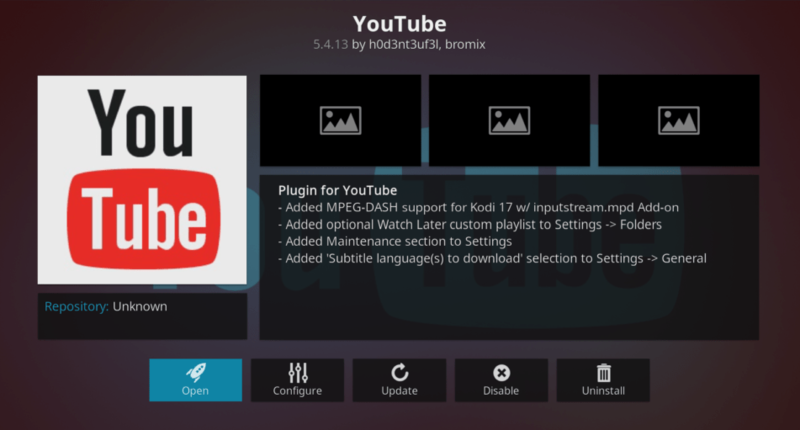 YouTube is available in the Official Kodi Add-on Repository and most other add-on repositories that have on-demand streaming add-ons. If you’re a sports fan there are few official add-ons better than the ESPN player. It does require a subscription, but you can choose one of three packages based on which sports you’re interested in. There’s also an option to hide the channels that your subscription doesn’t cover from within the add-on itself. The streams are in high-definition, but despite this, they tend to load pretty quickly. As with the YouTube add-on, you have to authenticate it before it can be used, but this is straightforward and shouldn’t take more than a minute. ESPN player does have some international support, however, there are some countries (like the UK and France) which cannot access its content. If you happen to live in one of these countries, all you have to do is set your VPN to one of the supported locations, and you’ll be able to watch all of your favorite sports without any problems. 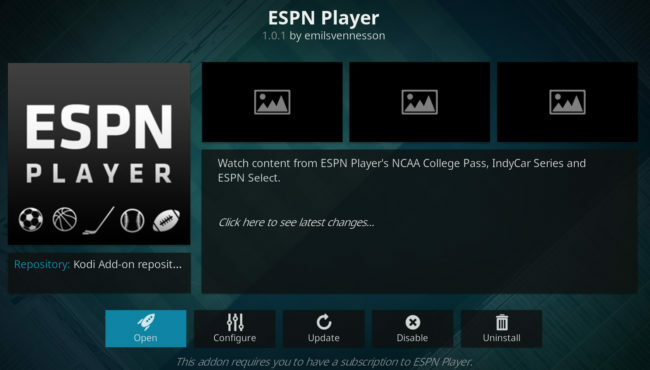 You can find ESPN Player in the Official Kodi Add-on Repository. PlayOn is a subscription service that accumulates several different subscription services in one place for easy viewing. As there’s no official Netflix or Amazon Video add-on, PlayOn is invaluable. Although there are a few sources that you can watch for free such as VH1 and YouTube, PlayOn really comes into its own when additional subscription based services are linked to it. 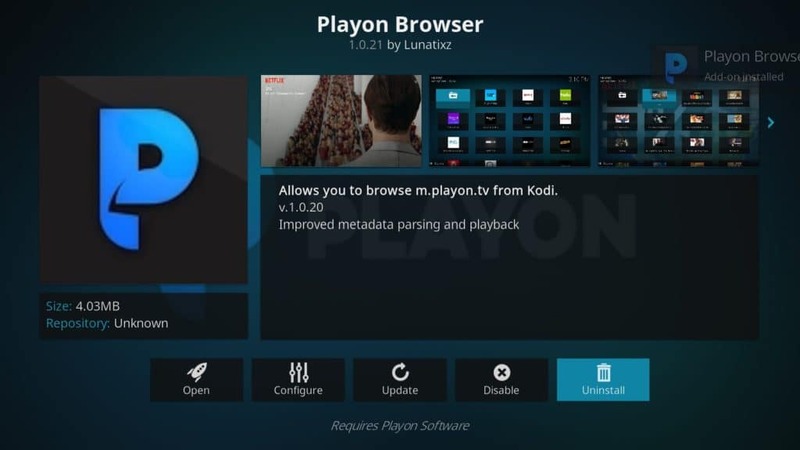 You can find PlayOn in the Official Kodi Add-on Repository. Despite the risks, some Kodi users will tend toward unofficial Kodi add-ons that typically provide pirated content. We do not recommend these add-ons for Kodi users. Below are a few add-ons which may be listed in other locations that are similar to Exodus and offer access to pirated content. We’ve provided some basic information regarding how these add-ons work, how they pirate content, and why we recommend more official alternatives. What is it? 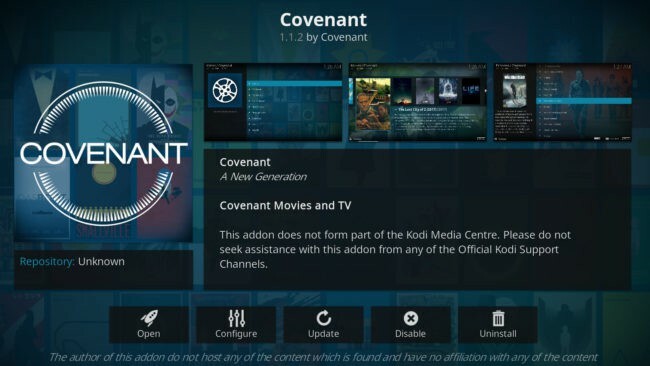 Covenant is the newly released fork of the infamous Exodus add-on. Essentially, it visits various different streaming websites, scrapes the links, and delivers them to the user. This means that the user can access a very wide range of media which isn’t limited to just one particular niche. Why should you avoid it? The most obvious reason to avoid Covenant is that the majority of the content it provides access to is illegal. Since sites which host this kind of content are subject to DMCA takedown requests, there is a high chance that the links provided will stop working in the future. This kind of content is often low quality as well– films often have foreign language subtitles obscuring the video and are recorded at a very low resolution. If you’re looking for high-quality TV and movies, you’d be better served using the PlayOn browser add-on mentioned above. What is it? 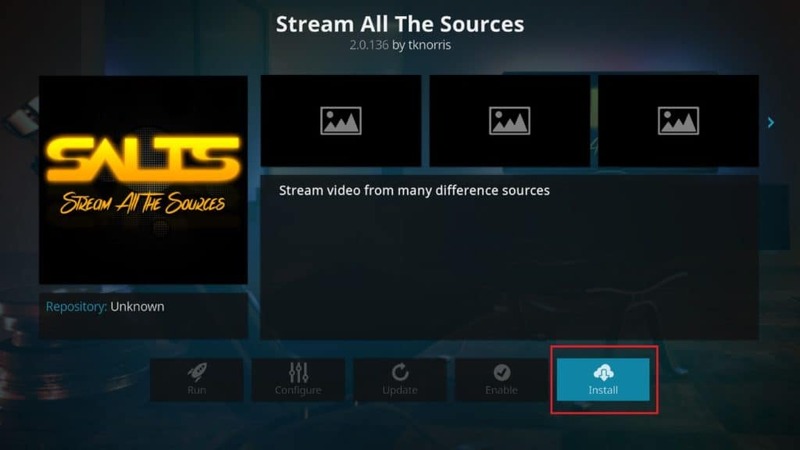 Stream all the sources (or SALTS) is another add-on which focuses mostly on providing access to pirated content. This is one of the most popular third party add-ons and it works in a similar way to Covenant, in that it’s primarily a link scraper. Why should you avoid it? While it’s true that there is some public domain content available, it’s few and far between. If this is the kind of content that you’re searching for, you’d be far better served using YouTube since it has a far larger user base and a built-in copyright flagging system. Whether you’re looking for classic movies such as Night of the Living Dead or just want to watch old documentaries, YouTube surpasses SALTS in almost every way. Read more here on the Kodi SALTS add-on. Although Exodus was one of the most well known Kodi add-ons, there are plenty out there which are able to compete. In this article, we’ve identified some of the best official and third-party add-ons so that you can decide for yourself. Is there a good official add-on that you know about? If so, let us know in the comments and we’ll try it out. See also: is Kodi safe and legal to use?